Search Results for "clean bed hospital"
In the Hospital Medical Ward Nurse Takes Care of a Patient Lying in Bed. Clean Modern Hospital with Friendly and Professional Staff. Shot on RED EPIC-W 8K Helium Cinema Camera. In the Hospital Nurse Enters Medical Ward and Does Checkup on a Patient Lying in Bed. Clean Modern Hospital with Friendly and Professional Staff. Shot on RED EPIC-W 8K Helium Cinema Camera. Sick Male Patient Lying on a Bed in Hospital. Clean and Calm Clinical Ward. Shot on RED EPIC-W 8K Helium Cinema Camera. 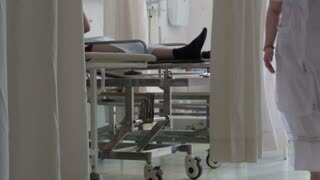 In the Hospital, Sick Male Patient Lies on a Bed, Fighting the Disease. Clean and Comfortable Medical Ward. Shot on RED EPIC-W 8K Helium Cinema Camera. A hospital curtain being opened in an operating room. A hospital curtain being closed in an operating room. Panning shot across an empty hospital room bed. Lowering shot of a blood pressure reader mounted on a hospital wall with the cord hanging down. Shot of a patients arm with a blood pressure cup on. Panning rising shot of an empty hospital room. 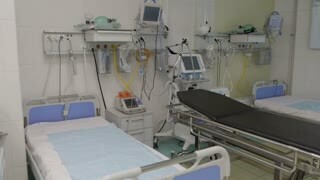 Empty hospital bed and various medical equipment in emergency room of modern clinic. With no people 3D animation on medicine and health care theme. 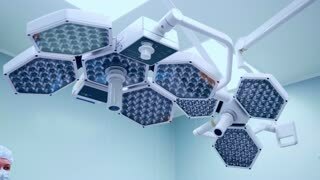 Switch on, switch off of surgical lamps in a surgery. Close up. Male surgeon and female assitant preparing for upcoming operation. Equipped hospital ward, close up. Latest medical x-ray technology. CT scanner. Radiology equipment. 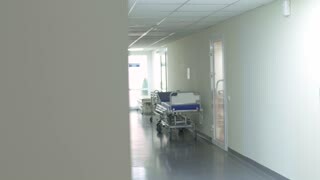 Walking down hallway in a hospital.